We love being a little bit silly here on GeekOut, so because we’re in the spirit of the season, we thought we’d have a list that was equally as silly as the season itself. Wait a minute, that’s not right – Christmas is a time of love, good will and cheer. Ah well, for the most part the list we’ve comprised of features some silly characters who would spread some Christmas cheer. Multiplayer games are a staple in the video game industry, as a way to interact with others through the medium… Or just to show someone how l33t you are. However in recent years, a lot of multiplayer games have changed how they are played. No longer are we playing games of healthy competition, but more games are out there to show that you’re better for having played them longer than someone else. Join me as I take a look back through multiplayer games of old and how modern games tackle the communication between people. We’ll begin by taking a trip down memory lane, or for many of us, a year before we were even conceived. In the early 1970s, the first ever Pong consoles were released to the general public and people were buying them by the boat load. Well okay, perhaps not quite a boat load of them, but people all over were willing to get their hands on a way to interact with their television sets in more than a typical watch the broadcast way. They wanted to play Pong, a game that was only available in the arcades prior, in their home with their own friends without having to take change to play on the machines. 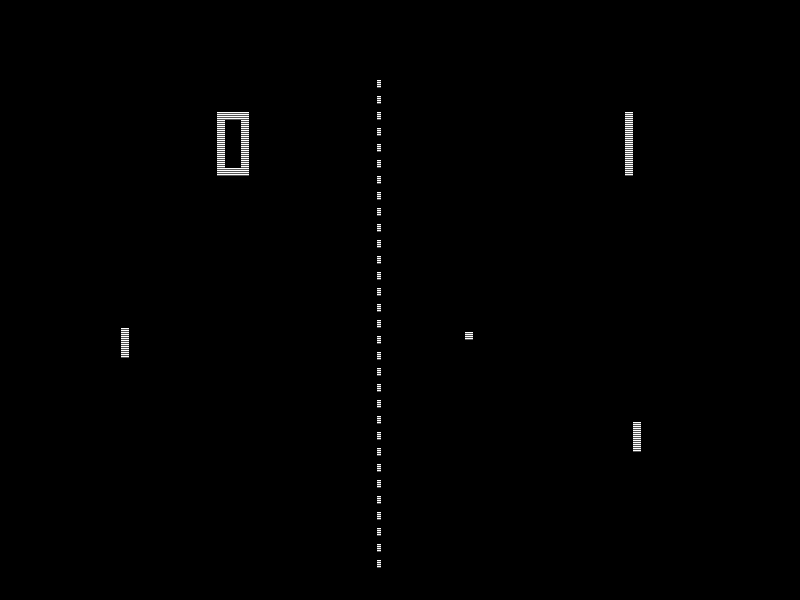 Whilst Pong was all well and good, it was just the first in a long line of easy games to pick up and play. We started to get games like Dig-Dug, Pac-Man, even games like Tetris supported more than one player after a while, for a little bit of competitive gaming between friends and family. But by the time the SNES was out, most of these simple two player games started to dwindle in favour for more complex, trickier to play single player games. Sure action games and fighting games were still popular enough to have two player modes, but games were already making their way into RPGs and more. 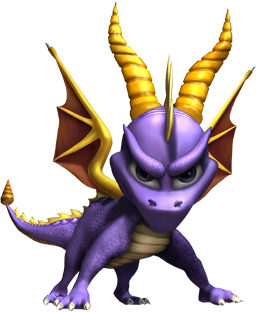 Spyro was one of many PS1 games that was incredibly popular but had no multiplayer functionality. Now this isn’t to say that multiplayer games disappeared, but they had to evolve and adapt. Over time, we went on to playing less random action/adventure games, less platformers and more into shooters. These games were more like Quake and Unreal. Around the same sort of time, the PS1 came out and even more single player games came out. Games along the lines of Crash Bandicoot and Spyro. In the case of Crash, this was a platformer that did away with multiplayer all together, in favour of a more in depth story in the game. It’s not a traditional platformer, but it still is one. Hey, at the end of the PS1 years, my favourite RPG of all time came out: Final Fantasy IX. No main Final Fantasy game had done multiplayer at this point. So shooters were the thing that really kept multiplayer going for a period of time, but then around the 2000s, the long standing MMORPG World of Warcraft came out. It’s incredible to think that next year the WoW community will have the Burning Legion to defeat in World of Warcraft. MMORPGs weren’t new… I was very accustomed to playing games such as Dark Ages of Camelot and City of Heroes at this point… But now the RPG genre was being more innovative and more involving of multiplayer, but really, this was a different way to play: This was about working together to defeat huge enemies, or fighting one another in intense battles. These are games of numbers, the more numbers you have, the better you do is the general rule of thumb. Now we’ve got the indie scene, a thriving community with countless fun games to play. Since I got my OUYA last year, I have played many cool multiplayer games, such as Amazing Frog? and Hidden In Plain Sight (which is also on Steam). These games have brought back the sense of fun, the sense of pure silly gameplay along with a little bit of competitive nature and in some cases: skill of the game. But whilst multiplayer games never left us, it sure feels now that we’ve got a more diverse library of games out there. Now there are games for those who want to invest plenty of time, as well as games which you just put on at a party. What’s your earliest memory of a multiplayer game? Share your favourite multiplayer games in the comments below, or over on Facebook and Twitter. P.S: If you are ever in doubt about a good multiplayer game to get into, consider getting a fighting game or a shooter. Those generally are multiplayer. If you want something a bit different, for fighting check out Guilty Gear, for the characters are so outlandish, you end up falling for each and every one of them. I personally like using Bridget and Faust as my guys. For FPS, I implore you to play the Unreal Tournament games. Those are my personal picks for franchises! I simply asked for one thing this year, if I was to get anything for my birthday. World peace, but if I couldn’t get that I’d settle for an OUYA if everyone chipped in together. Chipped in together they did and I’m afraid to inform you that world peace still isn’t a viable option to buy off a shelf, but the OUYA is. 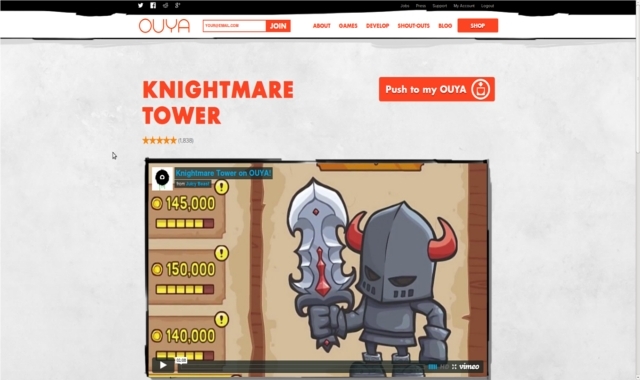 In 2012, a Kickstarter Campaign was made for something called an OUYA (Pronounced as OOOO-yah), which was set out to be “a new kind of game console” and a new kind it was. The premise was simply to use an Android operating system to provide a cheap, small console; A microconsole as it were! When I say this console is small, it’s basically a small box. We’ll go into the specifics of the OUYA shortly. The idea behind who would buy an OUYA was simple: It’s an open-source games console. How open is it? It allows you to get to the hardware simply by using a screwdriver to take the case off. It allows you to alter the code because it’s all open source software. It allows you to create games for it, using the OUYA Development Kit (ODK). All of this stuff is free to do with the OUYA, which is something you’d have to pay good money for on say an Xbox, PlayStation or Wii console. That aforementioned Kickstarter Campaign happened to be one of the most backed campaigns ever. It was able to achieve a whopping $8,596,474 from 63,416 backers. They were asking for $950,000, so they kind of smashed their goal. 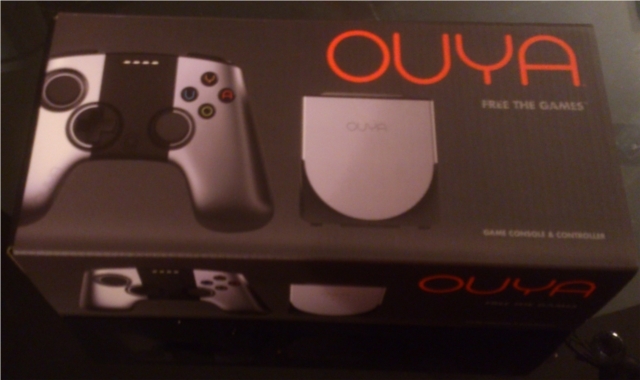 The OUYA comes in this nice black box which simply displays the OUYA itself. Inside of the box we have the console as well as one controller which is exactly as displayed on the box. We’ll discuss the controller in a bit more detail shortly. First of all, let’s have a look through the box. Joking aside, they give you this plastic translucent sheet which looks nice enough in the box. There is a small cynical part of me that asks what the need for it is and the simple answer is that there is no need for it. But, take a step back and just smile about it. 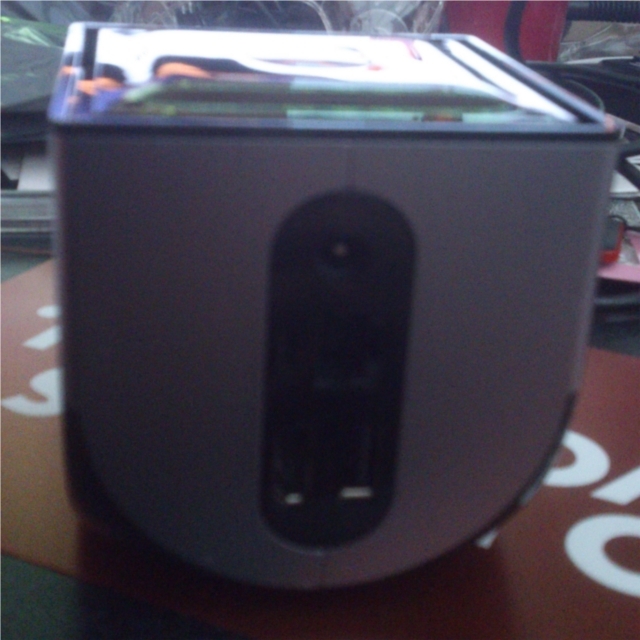 It’s a nice little piece to get in the box and it represents what the OUYA stands for: Making a change. 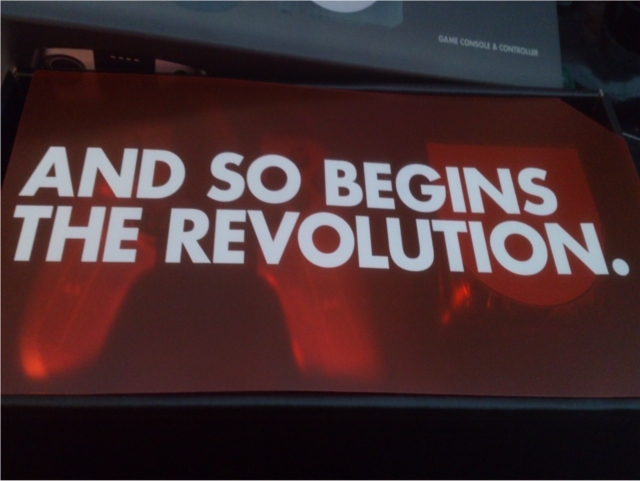 It’s about being a revolution and heck, it looks quite nice in the box. So underneath that then we have ourselves a controller and an Ouya. Let’s discuss the various features of the controller now as that’s something that can make or break a console. The controller provided requires 2 AA batteries (which the developers kindly put in the box! I didn’t realise this at first, rushing to get the controller working, so I used 2 of my own.) The two batteries goes in the two sides where you see the sticky plastic with “AA” on them. You put one battery in each side, by taking off the covers for each side. The covers simply “peel off” and as such, it’s easy to get the batteries in. There are 4 face buttons which spell out OUYA as well as 2 analogue sticks and a D-Pad. This mimics the style of the Xbox controllers and it does a good job. There is a left and right trigger as well as a left and right bumper. All of the buttons feel pretty good and they’re all responsive. The D-Pad and analogue sticks are all responsive and easy to use, too. Finally on the controller, in the very middle there is a touch pad. This is because this is still an Android based machine, so for the Android apps that work with touch screen monitors, you do not lose on functionality. On the OUYA itself then there are a few ports available. There’s a power outlet to keep the console running and there’s a USB port for other controllers. There’s an ethernet port and a HDMI port to allow you to plug the OUYA up and keep the internet connection stable. It’s important to note the normal OUYA controller runs on Bluetooth which is picked up on the OUYA console by pressing the OUYA button on the controller when the console is on. The two then sync up and you’re good to go. Another impressive point of the OUYA is that it’s very quick to boot up. It seems to take just a few seconds from off to fully booted. The rest of the boxes contents. Pretty simple! 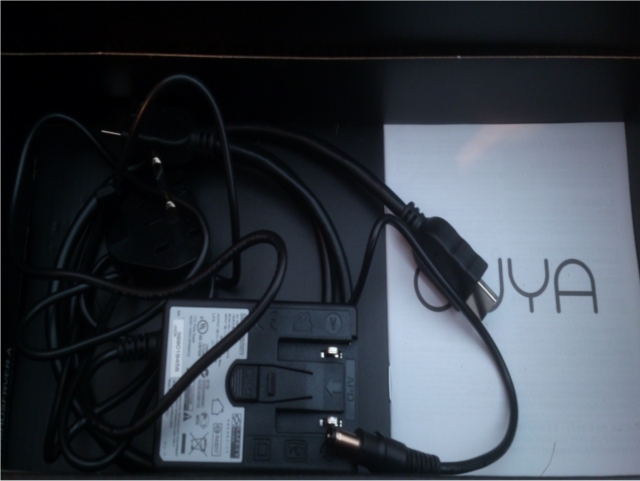 Finally, underneath the OUYA and console, you are provided your power source and if you’re from the UK like me, they give you an adapter to work with our British plugs. As well as this, they provide you with a HDMI cable and an instruction booklet. The OUYA prides itself on simplicity and in this respect it really does a great job, with just a power cable and a HDMI cable being necessary. I run my OUYA over Wi-Fi which works with no problems found. There are a few exceptions to this rule, but as a general rule of thumb, just about every game you look at in the OUYA store is free to try before you buy. This is part of what the OUYA wanted to do: Bring developers another platform they can develop on and bring it to them for free and expand their user base. The quality of games on OUYA have been steadily growing and there are currently over 850 games and apps made for the OUYA. This game is seriously fun as well. You can push a game to your OUYA from the website shop.ouya.tv, or you can just download the games direct from the console itself. Either way, games (and apps) queue themselves for downloading if there are others waiting to finish downloading and it’s all pretty smooth and easy to play around with. There’s a long life ahead of the OUYA and the company are keen to work on their next console with the success of the campaign and the first released console. There are some established names such as Square Enix and Tripwire Interactive who have produced games for this console and I’m eager to see what the future of a console of this kind is. OUYA is here and believe it or not: It’s brilliantly good fun. In the coming months, I’ll be giving you an occasional review of games from the OUYA. There are two main ones for me which are potential negatives but I don’t see them as real negatives. One is that you have to download your games directly. This means that I can’t just go to a shop, get a disc and put it in. Instead, I have to be connected to the internet and download a non-physical game. This isn’t a problem to me as I’m very used to using Steam. The other problem is that while every game on the OUYA is free to try, you will need a valid credit, debit or redeemable code to download any game. Again this isn’t a major problem but for people who are very security conscious, it’s something to be considerate about. The OUYA will not charge you a penny unless you tell it to and you can remove a lot of details from the console. I’ve had this console for around a week now and I’m impressed with it. Now, let’s give it some more time and perhaps I’ll have some good game and app reviews for you? In the mean time, I’m happy with receiving my OUYA and I’m glad to be able to play some fun, silly games. One of the first games I downloaded mostly because of how fun the Game Grumps made one OUYA game look. I will be looking into this game to review on here eventually, so watch this space. The game in question is the above, Amazing Frog? which honestly when with other people is a blast! 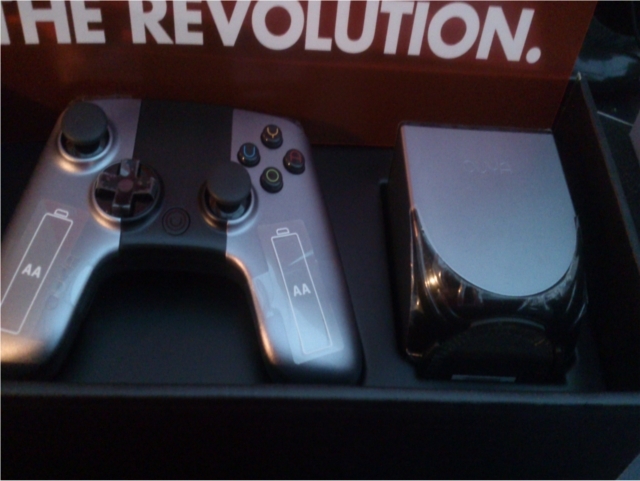 What do you all think of the OUYA? I’ve been enjoying it so far and I hope to be giving you some more pictures and reviews of this fun little console soon.